Several Democrats condemn the money flowing into national elections because of its "corrupting influence." 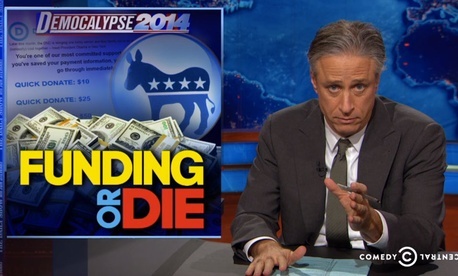 But in midterm races, many liberal groups are outspending their opponents. The Daily Show host Jon Stewart doesn't take kindly to this hypocrisy. Plus: Michelle Obama goes to bat for Iowa senate candidate Bruce "Bailey," and North Korea leader Kim Jong Un misses a high-profile national celebration.